D.R.E.S. tha BEATNIK Presents…. 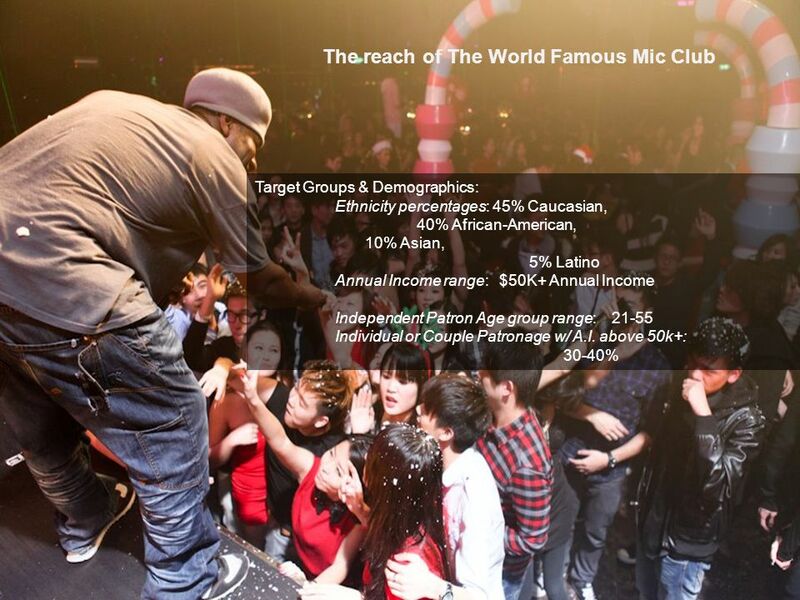 The World Famous Mic Club For over 12 years, The World Famous Mic Club has attracted international attention for it’s. 2 The World Famous Mic Club For over 12 years, The World Famous Mic Club has attracted international attention for it’s gritty and groundbreaking format. Mic Club has not only toured nationally but internationally with regular treks throughout China. Powered by D.R.E.S. 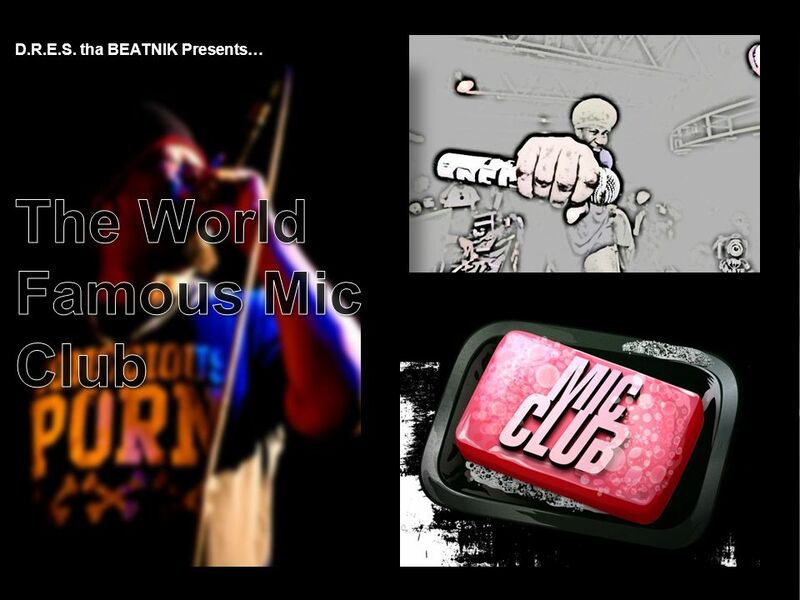 tha Beatnik, The World Famous Mic Club has continued to be one the most sought out event brands in Hip Hop music. The weekly hip-hop battle is known for sharpening the skills of artists, producers and DJs with tournament style competitions Since its inception in 2001, the freestyle MC battle has been the cornerstone of Mic Club, but there's also the Mighty Mighty Beat Down producer battle, the Final Scratch DJ battle, and Crowd Control, which tests performance skills in front of a live audience. The latest addition to the agenda is the MP3 Massacre, which consists of music heads vying to one-up each other by showing off who has the best tracks on their iTunes, Zune or whatever MP3 player they're packing. These won't be original tracks, but a spin through playlists to see which generates the most enthusiastic crowd response. The World Famous Mic Club has proven to be a valued commodity amongst music lovers world wide and has proven it’s staying power into the future. 3 Who is D.R.E.S. tha Beatnik?? D.R.E.S.' career started at a very young age -- singing, dancing, MCing, and beatboxing. A former dancer for Russell Simmons' Def Comedy Jam & member of The UNIVERSAL ZULU NATION & BEATBOXER ENTERTAINMENT. D.R.E.S. has been in the presence of many industry leaders who have helped him develop his unique style and presence. D.R.E.S. 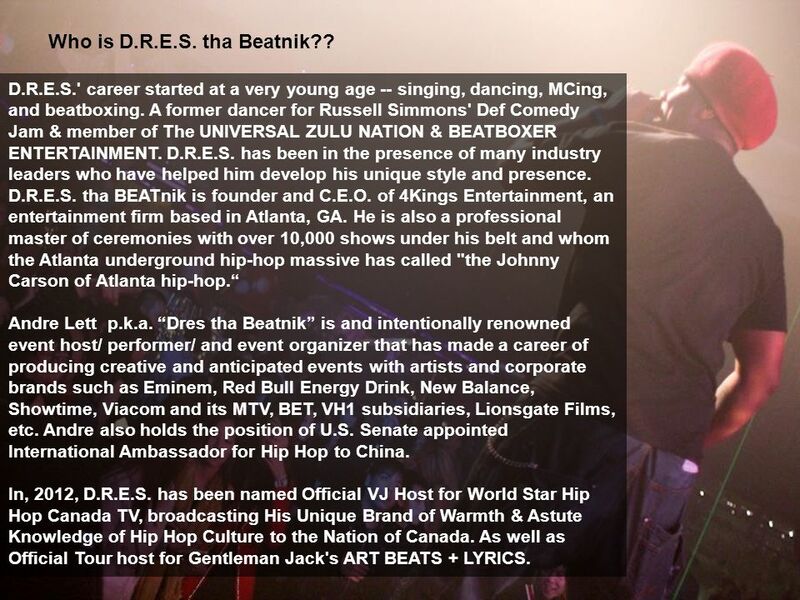 tha BEATnik is founder and C.E.O. of 4Kings Entertainment, an entertainment firm based in Atlanta, GA. He is also a professional master of ceremonies with over 10,000 shows under his belt and whom the Atlanta underground hip-hop massive has called "the Johnny Carson of Atlanta hip-hop.“ Andre Lett p.k.a. 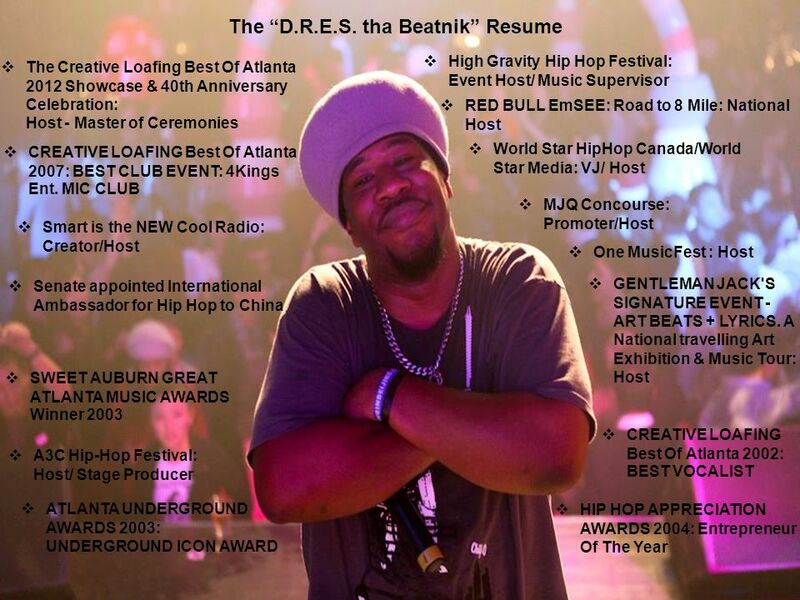 “Dres tha Beatnik” is and intentionally renowned event host/ performer/ and event organizer that has made a career of producing creative and anticipated events with artists and corporate brands such as Eminem, Red Bull Energy Drink, New Balance, Showtime, Viacom and its MTV, BET, VH1 subsidiaries, Lionsgate Films, etc. Andre also holds the position of U.S. Senate appointed International Ambassador for Hip Hop to China. In, 2012, D.R.E.S. 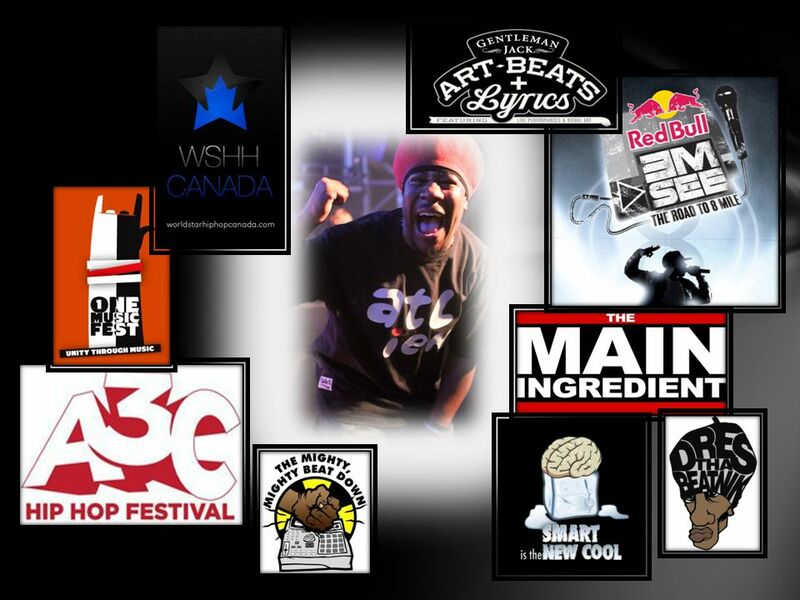 has been named Official VJ Host for World Star Hip Hop Canada TV, broadcasting His Unique Brand of Warmth & Astute Knowledge of Hip Hop Culture to the Nation of Canada. As well as Official Tour host for Gentleman Jack's ART BEATS + LYRICS. 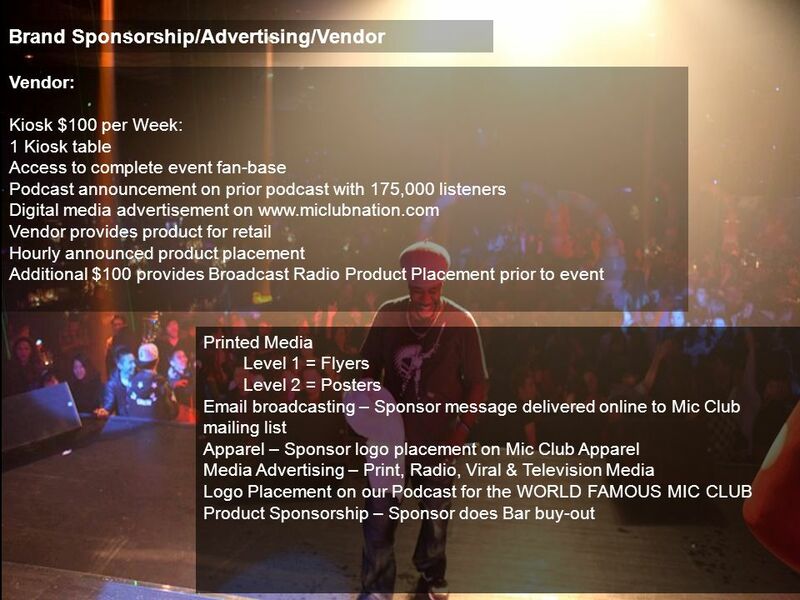 5 How partnering with The World Famous Mic Club Benefits YOU The World Famous Mic Club has become a loved institution of the Atlanta music scene. Several regional and national brands have taken advantage of the relationship it has with it’s patrons. Brand loyalty is one of the most sought after attributes of any corporation, only attained through diligence and providing an excellent product. 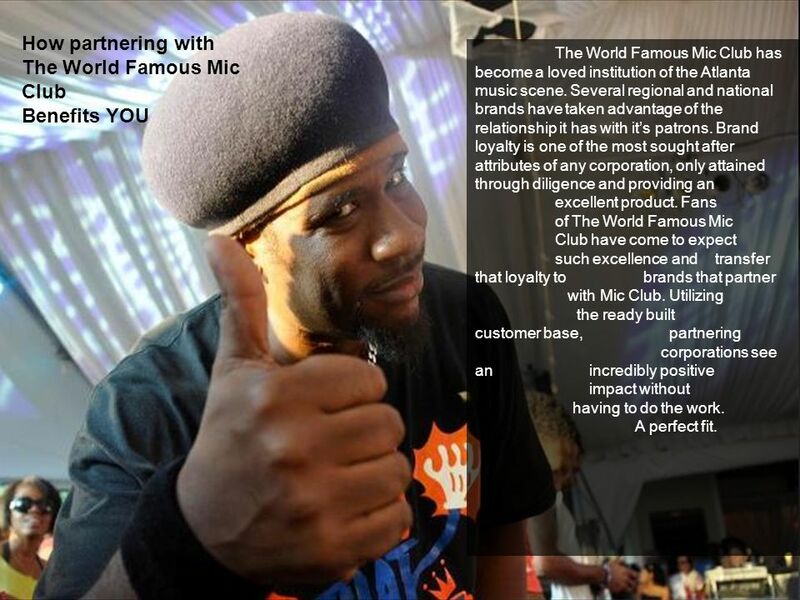 Fans of The World Famous Mic Club have come to expect such excellence and transfer that loyalty to brands that partner with Mic Club. Utilizing the ready built customer base, partnering corporations see an incredibly positive impact without having to do the work. A perfect fit. Download ppt "D.R.E.S. tha BEATNIK Presents…. 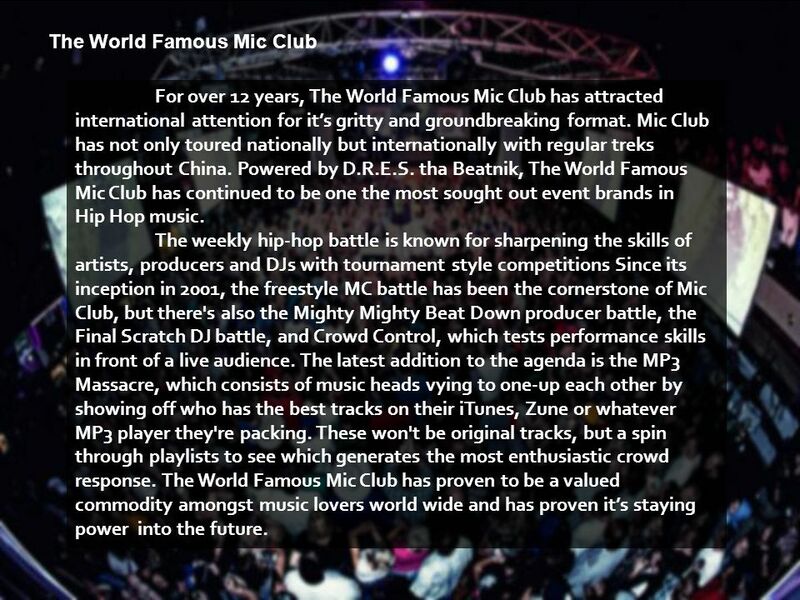 The World Famous Mic Club For over 12 years, The World Famous Mic Club has attracted international attention for it’s." Sponsorship Packet Downtown In Oz Festival Downtown In Oz The Downtown In Oz Festival celebrates the family-oriented classic of The Wizard of Oz. Stay Connected Were reaching out to you…stay connected with the leading HBCU. Advertising Fashion. Advertising the Product o Fashion Advertising: the paid communication between product maker or the seller and the audience or the.  CC VIP Productions is a multicultural production company that specializes in bridging the gap between artists/celebrities/athletes/entertainment entities. April 29 th - May 3 rd, 2015 Forum de Beyrouth. Today’s woman is independent, strong, career - oriented yet feminine, juggling between family life & assuming. Dinner and a Movie The classic combination of dinner and a movie are two valuable incentives that naturally go great together. These rewards are widely. THE RACE OF CHAMPIONS HOST VENUE PRESENTATION. THE ROC WORLD FINAL IN YOUR COUNTRY. Pizza Rewards Slice into success by rewarding customers with America's favorite food. Pizza! As customizable as a pizza pie itself, Pizza Rewards are. 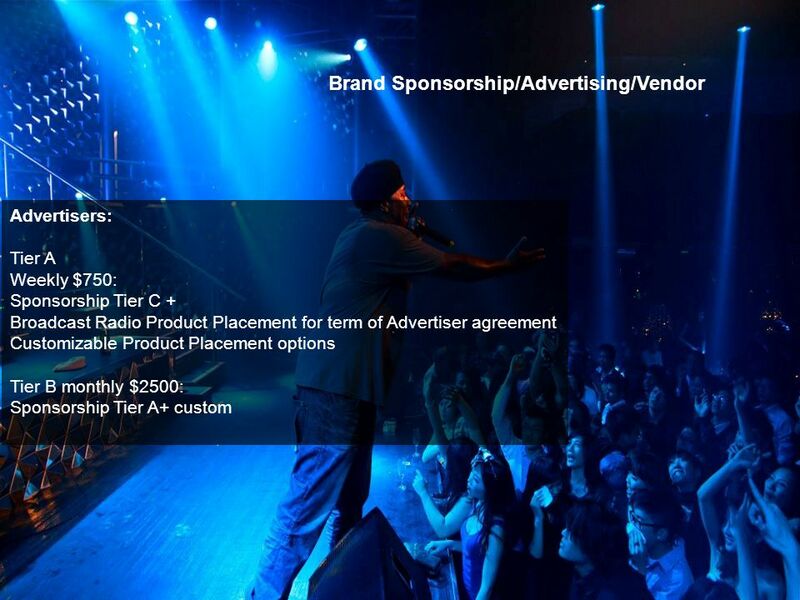 Sponsorship Opportunities for the New York in Beijing Jazz Festival Spring 2012. INDIE WEEK Independent Music Festival “Best of the Fest” Competition – 1 band voted as top act Music Conference Digital / Interactive Conference Networking. 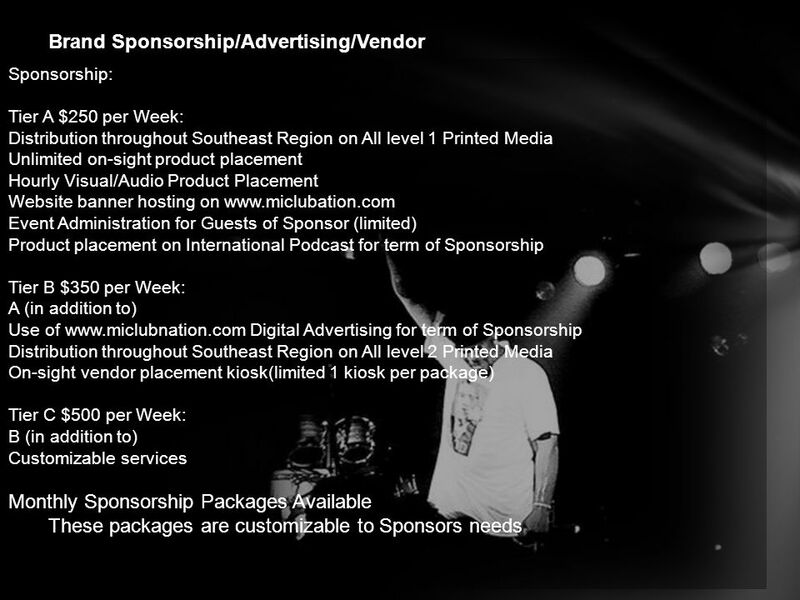 FEMIFEST SPONSORSHIP OPPORTUNITIES FOR FEMIFEST MUSIC FESTIVAL. DUBLIN AFRICAN FILM FESTIVAL. AGENDA Background African Filmstar overview Casting sessions Awards ceremony Film production Critical success factors Benefits.